MAXIM Integrated Products, represented by Arrow , has introduced four ±15kV ESD-protected USB transceivers, which provide low-voltage ASIC/CPUs with a USB-compliant physical layer interface. The four USB transceivers, the MAX3453E to MAX3456E, have USB D+ and D- data lines which are protected to ±15kV as per the human body model. This enhances protection against ESD strikes along the cable and eliminates external protection circuitry. The transceivers are suitable for handheld devices such as cellular phones and PDAs. Packaged in a space-saving 16-pin TQFN and 14-pin TSSOP, the MAX3456E is a pin-for-pin compatible upgrade to the MIC2550A. Available in the same TQFN and TSSOP packages, the MAX3453E to MAX3455E provide additional features utilising the unused pins of the MAX3456E. The MAX3453E and MAX3454E include a 1.5kΩ pullup resistor and enumerate input, enabling software control of USB enumeration and eliminating the need for an external resistor. The MAX3453E and MAX3455E detect the availability of VBUS and provide a logic-level output to the ASIC/CPU. 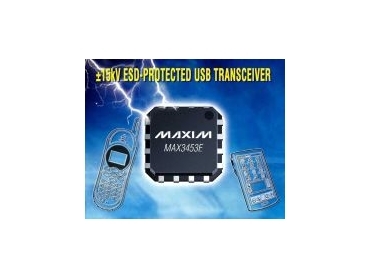 The MAX3454E to MAX3456E are compliant to the USB specification revisions 1.1 and 2.0, and operate at both low speed (1.5Mbps) and full speed (12Mbps). The MAX3453E is specified only for full-speed operation. The MAX3454E and MAX3456E can be powered by VBUS from the USB host, directly from a Li-Ion battery, or from a 3.3V supply. The MAX3453E and MAX3455E require a 4V to 5.5V supply provided by the USB host. All devices feature a low-power suspend mode and work with ASICs that operate down to 1.65V. The MAX3453E to MAX3456E are specified over a temperature range of -40°C to +85°C.